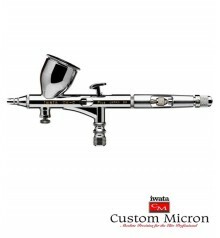 IWATA CUSTOM MICRON CM-C 023 airbrush Iwata Custom Micron airbrushes iwata airbrushes airbrushes AIRBRUSHING - Belles Arts Ferran, S.L. The CM-C, is the appropriate item, for professionals that should work with heaving paints or in works of great size. The system Custom Micron guarantees a superior quality of powdered. The nozzle is of 0,23. This model unites the precision and the work volume.